Harvey Feuerstein is chairman emeritus of Herrick, Feinstein LLP. He served as chairman of the firm’s Executive Committee from 2001 to 2012 and, previously, as chair of the firm’s Litigation Department. 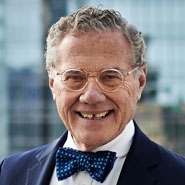 Harvey first joined the firm in 1969, when it was comprised of only four real estate lawyers; and he has been a vibrant member of the firm for 50 years. Harvey concentrates his practice on business divorce, representing owners who seek to profitably disengage from their associations with successful businesses and professional firms, including law firms and medical partnerships. He steps in when internal strife threatens the continued success of the enterprise and one or more owners are increasingly distressed and emotionally drained. Harvey's combination of business savvy, deal making and litigation skills substantially improves the likelihood of a successful separation, and clients have the benefit of a single person overseeing the resolution of the myriad business, tax and legal issues involved in every business divorce. Many major law firms and prominent owners of privately held businesses have taken advantage of Harvey's experience as a counselor, negotiator and litigator, and he has drawn the attention of the nation's leading media over the years.